Slice the eggplant in half lengthwise and arrange on a foil or parchment lined sheet pan, cut side up. 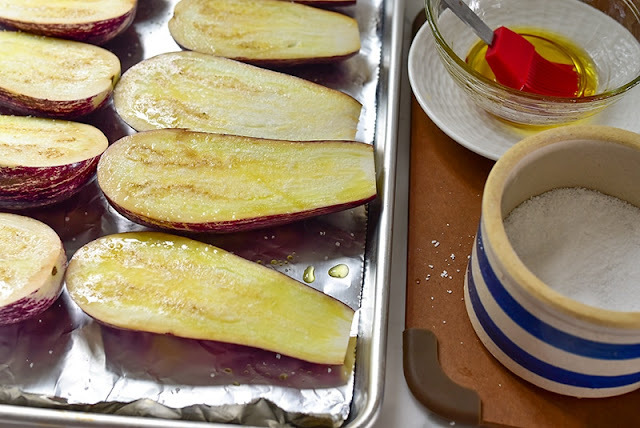 Brush the cut sides with a tablespoon of the olive oil and sprinkle lightly with salt. Place the pan under the broiler on a rack about 3 inches from the broiler, and broil until the tops are deep golden brown. Remove from the oven and set aside. Move a rack to the center of the oven and heat the oven to 375 degrees F.
In a medium sauté pan, heat the remaining olive oil over medium heat. Sauté the onion with a pinch of salt until translucent and cooked through, but not browned. Add garlic and saute just until fragrant, about 30 seconds. 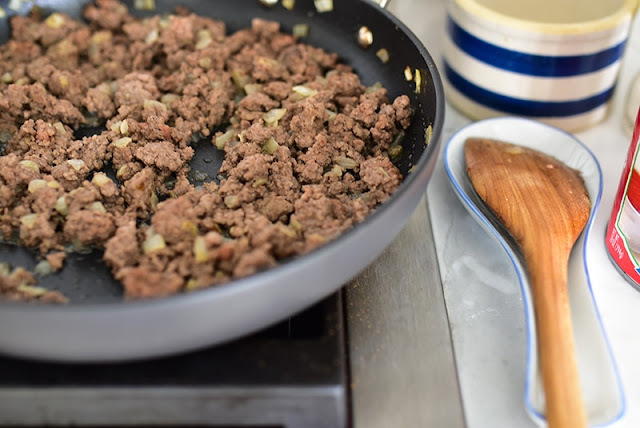 Add the ground meat, sprinkle with cinnamon, more salt, and pepper, cooking and breaking up the meat into small pieces until it is juicy and browned. Add half of the tomato sauce (we’re using the rest shortly), bring to a simmer, and cook over low heat for about 10 minutes, or until the sauce takes on a meaty, flavorful taste. Taste and add more cinnamon, salt, and pepper if needed. 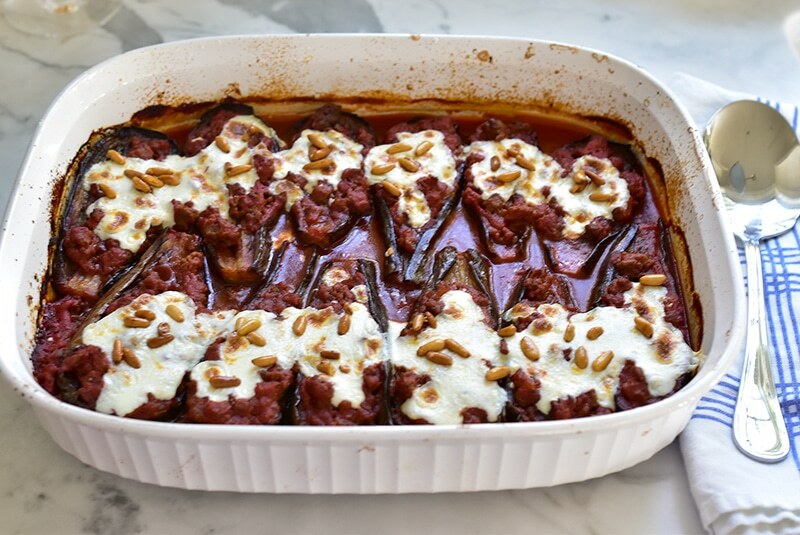 Arrange the eggplant halves in a large casserole or lasagna pan. 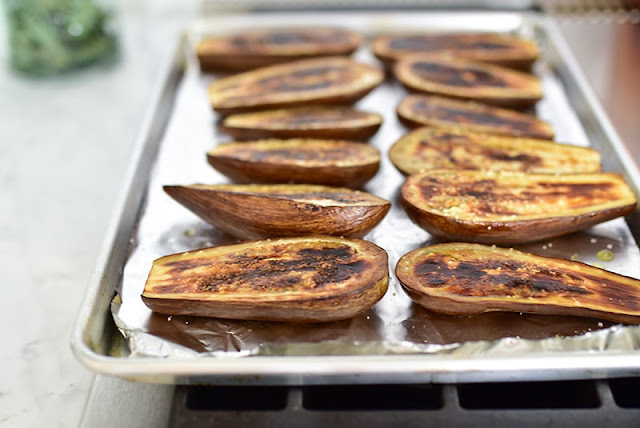 Using a sharp knife, cut a slit lengthwise down the center of each half and push the eggplant from either end to open the slit slightly for the filling. 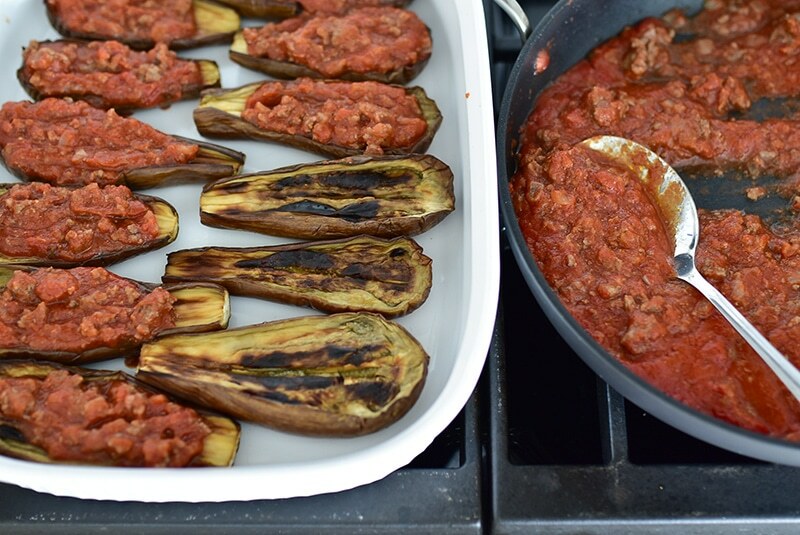 Spoon the cooked tomato meat sauce into the slits and mount on top of each eggplant half. Then, in the same saute pan, heat the remaining tomato sauce with ½ cup water and season lightly with salt, pepper, and cinnamon. Simmer for about 5 minutes, then spoon the sauce into the casserole around the eggplant. Cover the casserole tightly with foil and bake for about 90 minutes. If you’re short on time, a shorter baking time is fine, but try to keep it in the oven for an hour. Toward the end of baking time, remove the foil and place the mozzarella pieces over each boat. Continue baking until the cheese is melted, about 5 minutes. Remove the casserole from the oven, sprinkle with the toasted pine nuts, and serve after the eggplant rests for about 10 minutes.